SMBs are the backbone of any economy; in America, they account for 99.7% of all US businesses. However, the impact of technology and shift to digital are changing the way these businesses are run. Every company needs to continuously reskill and adapt their workforce to stay competitive, but SMBs often lack the massive budget and organizational resources to address such needs. In fact, according to Bank of America’s 2015 Small Business Owner Report, small business owners’ #1 priority for using loan capital is training and developing existing staff due to difficulty in locating new, qualified candidates. At Coursera, we’re excited by our mission to transform lives through learning, and we recognize that making our platform available to employers is key to expanding our reach and impact. This is why we launched Coursera for Business in August 2016: to give major employers across the world access to a scalable platform that delivers world-class content and an exceptional learning experience. We launched with large enterprises in mind – those who need to upskill and retrain their globally-distributed workforces – but soon realized this challenge is one that all companies are facing, regardless of their size. Today, we’re excited to announce that we’re extending the reach of Coursera for Business to provide small and medium-sized organizations and teams with the fast, flexible, self-serve deep skilling options they need to keep their workforce competitive – at a price that makes sense. Through our new offering, smaller companies like LWCC, Louisiana-based workers’ compensation carrier, and Finland-based Angry Birds franchise creator, Rovio, are able to upskill their employees in everything from data science and machine learning to leadership and writing, with access to our full catalog of 2,600+ courses from the world’s best universities. Curate several learning programs for different groups of employees according to their company’s specific needs. Whether the team is interested in learning Google Cloud content, or data science from top universities or simply wants to develop advanced Excel skills, Admins can now easily curate programs for individuals and teams. Track their employees’ progress with an easy-to-use dashboard. They can send reminders to learners to join a program, enroll in courses and a nudge to complete assignments – all from the platform. Easily purchase what they need via credit card or PayPal, and add new learners to their ongoing programs. Learn on their own schedule, with Coursera’s robust mobile platform. All these can be done by business owners and team leads themselves, making it simple for companies who do not have dedicated resources to manage the platform with ease. With this new offering, Coursera for Business will help smaller organizations retrain their workforces and effectively prepare their businesses for the future. Coursera for Business has become a critical partner for large enterprise and small businesses alike as they execute on their workforce transformation goals. 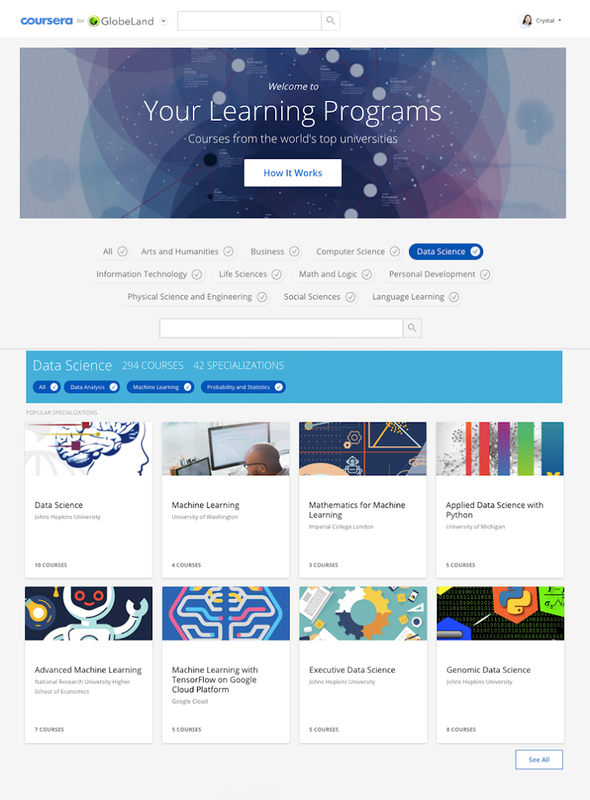 You can learn more about Coursera for Business for enterprises and SMBs, and inquire about using Coursera for Business at your organization, on this page.